Moving tips for relocation made easy. Relocation is not an easy task to do. You have to do a lot of serious thinking and planning to make sure that all goes well with your relocation. Although it might seem tough, there are some moving tips for relocation in order to make it more painless and easy. When you’ve finally decided to move, make sure you break the news to your family and friends, and don’t forget to notify other public and private institutions like the post office, your local milk or newspaper delivery, and utility companies, among others. If you have children, it is a wise step to sit down and talk with them regarding the relocation. Moving from Toronto can be difficult for children, so take the time and effort to tell them about the move earlier on. This way, you give the children more time to prepare themselves for the upcoming move. It would also be a wise idea to inform your close friends and relatives, so they can properly say goodbye to you. Maybe you can even throw a going-away party, where you can exchange helpful moving tips for relocation with one another. Considering your research options is one of the moving tips for relocation. When relocating, it helps to know more about the moving industry, so you can choose the moving service that’s right for you. Learn to differentiate van lines, van line agents, moving brokers, and independent or “full service” carriers from each other. Once you’ve got everything in order from the travel and storage arrangements, to the necessary paperwork, disposal of belongings you can’t take with you, and packing, it’s time to prepare yourself for the actual moving day. 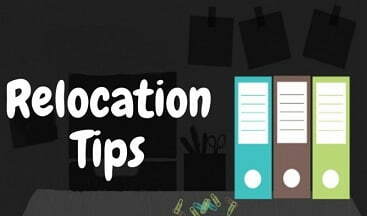 Most moving tips for relocation miss out on a very important day, the moving day itself. This is where all your preparations kick in, and keeping an eye over the moving day will prepare for unforeseen events. Keep a separate box containing all the essential items you will need for the trip and right after you arrive at your new home. This is so you can have easy access to these important items. Such essentials include your ID, wallet/checkbook or ATM card, bottled water, toiletries, prescription drugs, aspirin, snacks (bread, granola bars, nuts), as well as paper cups, plates and utensils, towels and sheets. Keep important files and documents in this box too. If you have pets, keep pet essentials accessible too . Then it’s time to load the truck. Arrange the items in such a way where nothing fragile can topple over and break. Also, maximize the space as much as possible. Before you leave the house, make sure you check if nothing has been left behind , and that the main power for electricity has been shut off, as well as gas and water valves. These are some moving tips for relocation. Relocation can be easy. It just takes a lot of time, planning, and support from family members and close friends. Moving to any province. Vancouver, Calgary, Edmonton, Winnipeg, Regina, Saskatoon or another locations. We are offer the best prices!